Delicious apricots enveloped by the sweet flavour of moscato. The fruit from Cascina Fiume is so good because it is harvested when ripe and placed in jars with very few ingredients. 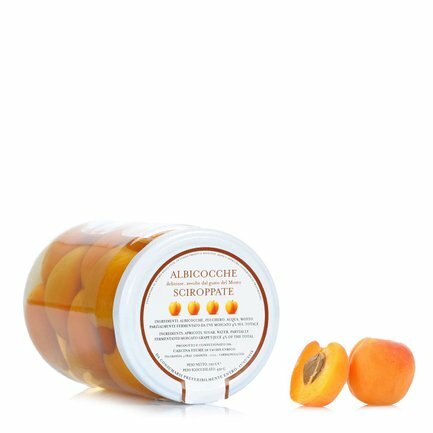 The only things added to these apricots are sugar, water and moscato grape must. Serve them in a cup or to make your deserts even more special. Ingredients Apricots, sugar, water, partially fermented Moscato grape must 4% of the total. For more information on product labels, please contact our Customer Service department. The information on the labels of the products may vary for reasons beyond our control, therefore, there may be discrepancies between the information on the site and that on the products delivered. Please always check the information on the product before consumption or use. Cascina Fiume passionately cultivates and prepares the fruit and vegetables from Carmagnola, in the heart of Piedmont. Here, the climate, but above all the soil, promotes the growth and maturation of these unique ingredients. The pears cultivated in the company, the whole apricots, the whole Santa Clara plums , the pears in syrup with lemon. Here are the specialties from Cascina Fiume. True delicacies.